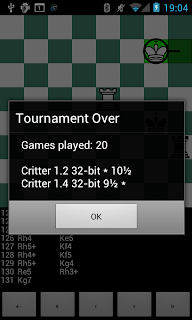 Richard Vida released Critter 1.4, including a version for Android. This ARM binary imports well into Chess for Android. A quick 1-second-per-move tournament from both sides of all opening lines in the Nunn test suite on a Nexus S ended in favor of the previous version though. Lucas Braesch released DoubleCheck 2.3 and I put an ARM binary on UCI and XBoard engines for Android (you can find another binary for ARM on Jim Ablett's website). Below, I show the results of a quick one-second-per-move tournament played from both sides of all lines in the Noomen test suite 2012 between some recent versions (32MB hash size, Nexus S). Another engine for ARM-based Android devices! Tony Hecker kindly made ARM binaries of Tjchess available as either an UCI engine or a XBoard engine. Both import well in Chess for Android. Some screenshots below. With so many new engines, is it time for yet another Android chess engine tournament? The list of chess engines compiled for ARM-based Android devices keeps growing. Someone pointed me to Borko Boskovic's Umko engine. 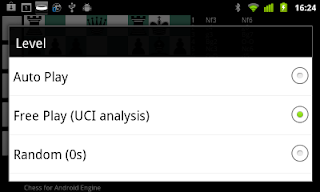 I tested this UCI engine in Chess for Android, and it works well. Some screenshots below. Group A has finished a complete thirty seconds-per-move tournament in Chess for Android, played from both sides of all positions in the Nunn opening suite under the conditions described earlier. Congratulations to Richard Vida for Critter's victory in this tournament! All games can be downloaded from the tournament page. This completes the Android tournament with longer time controls (although since many more engines are available now, perhaps another one is already necessary!). Jim Ablett kindly compiled Jon Dart's Arasan engine for ARM-based Android devices so that it can be imported in Chess for Android. 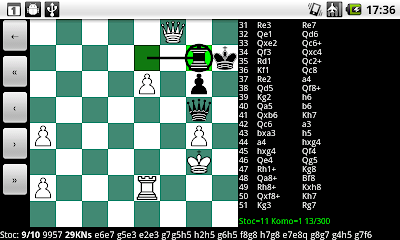 The engine supports multithreading, Nalimov endgame tablebases, and clocked at about 100Kns out of the opening on my Nexus S.
As posted earlier, Jim Ablett posted an Android Chess Engine Bundle, which various UCI and Win/XBoard engines that can be imported in Chess for Android. 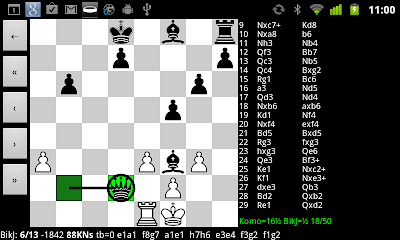 Because the Win/XBoard protocol feature is still relatively new in Chess for Android and conducted a test tournament between all the XBoard engines (except gfc-08-rev5-ja which often claims a mate without actually making the move; I am not sure if the standard allows this, but it seems weird that the GUI should verify the claim). During this tournament I found a few opportunities for improving the GUI's handling of the protocol, which will be released soon. Also, the next release will add the much requested pondering feature (also called permanent brain). 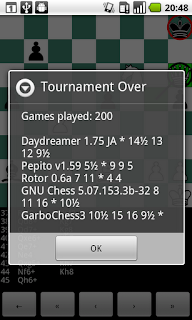 Group B has finished a complete thirty seconds-per-move tournament in Chess for Android, played from both sides of all positions in the Nunn opening suite under the conditions described earlier. Regrettably I found that Crafty was put at a slight disadvantage (not something that would have changed the outcome though) due to a misinterpretation of XBoard's resign plus move command, causing a resign by illegal move in the next game. This issue has been fixed now. Congratulations to IvanHoe for its promotion to Group A. The games of the final group A have started! Jim Ablett very kindly posted an Android Chess Engine Bundle with various UCI and XBoard engines that can be imported in Chess for Android. Group C has just finished a complete thirty seconds-per-move tournament in Chess for Android, played from both sides of all positions in the Nunn opening suite under the conditions described earlier. Congratulations to Gary Linscott for GarboChess' promotion to Group B. 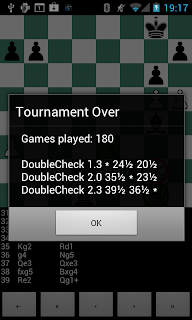 After many more cycles on my Nexus One, Group D has just finished a complete thirty seconds-per-move tournament in Chess for Android, played from both sides of all positions in the Nunn opening suite under the conditions described earlier. Quite a shuffle-up in the results this time compared to the qualification tournament. Congratulations to Aaron Becker for Daydreamer's promotion to Group C.
The Micro-KIM arrived today! I did some initial experimentation with my 6502 cross-assembler and was happy that the paper tape format l recently added could be uploaded to the device without any problems. 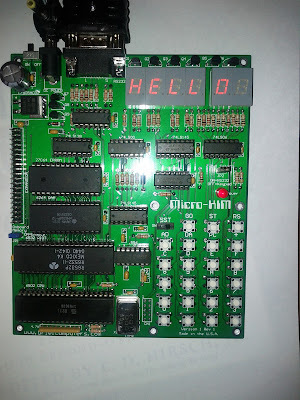 What better first program to write than "HELLO WORLD" (except only HELLO fits on the display)? It was fun figuring out how to control the display using low level 6502 programming. After burning cycles on my Nexus One for many days, Group E has just finished a complete thirty seconds-per-move tournament, played from both sides of all positions in the Nunn opening suite under the conditions described earlier. Congratulations to Ben-Hur Carlos Vieira Langoni Jr for RedQueen's promotion to Group D.
As a present, my wife ordered the Micro-KIM from Briel Computers for me, which is a modern replica of the KIM-1 microcomputer. Even though I learned machine code on the 6510 of the Commodore 64, I remember seeing the KIM-1 in an electronics store much earlier, and I was intrigued right away. I can't wait for it to arrive to do some vintage programming. In anticipation of the Micro-KIM's arrival, I extended my 65xx cross-assembler (available for Windows, Linux and MacOS) with the paper tape format, either in the original binary format (option -p) or in a text representation (option -P) so that its output can feed directly into the Kim's terminal interface. I simply generated the format based on old documentation and it is still untested. If someone is interested in trying it out, I would appreciate early feedback. Otherwise, I will report back when I get my Micro-KIM. Group F has just finished a complete thirty seconds-per-move tournament, played from both sides of all positions in the Nunn opening suite under the conditions described earlier. Congratulations to Evert Glebbeek for Jazz's promotion to Group E! Charles Bond wrote a nifty 6502 simulator, called Soft6502, which I find useful for testing small programs written for the 65xx microprocessor family. The simulator supports the full 6502 instruction set and two 8-bit ports for input and output. Programs can be entered one byte at the time through the keyboard or, more conveniently, loaded from file. The simulator uses the H6X file format, which is a simple, but surprisingly versatile way of representing 6502 code (essentially an ASCII representation of addresses followed by bytes). I have extended my 65xx cross-assembler (available for Windows, Linux, and MacOS) to support this H6X file format, so that its output can be directly fed into Soft6502. I just released version 3.0.2 of Chess for Android, available at the Android market and as direct download. This release enhances XBoard/WinBoard support (infinite analysis, resign feature, older idioms used by various engines). The qualification results are used to split the engines into separate groups. Engines in each group will play each other at longer time controls, starting with the lowest group. The number one in each group will promote to the next group. The cross-table and all games can be downloaded from the tournament page. I made various improvements in the WinBoard/XBoard implemention in Chess for Android and are now able to successfully import and play with the following XBoard engines (I also tested the corrected UCI sungorus engine). Below, I posted the cross-table of a quick test tournament from both sides of just the first position of the Nunn opening suite. I ran tournaments between different versions of the same engine to determine which one would be their representative. 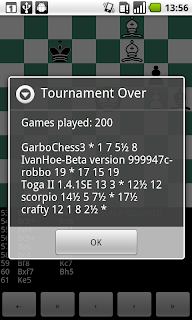 Below I show the results of a fast round-robin tournaments using Chess for Android on a Nexus One, Nexus S, and Galaxy Tab with, where applicable, 8MB hash table and 1MB tablebases cache (Nalimov, Gaviota, Scorpio, and Robbobases reside on SD card). Each version played each other version from both sides of the Nunn opening suite. The number one engine will play in the longer time control tournament (which is not always the latest version; engine authors let me know if you prefer otherwise since some results were pretty close). Also, Pablo Vazquez and Jim Ablett kindly worked together to fix the issue in the sungorus. It now runs correctly and will participate in the tournament. The list of UCI and XBoard engines for Android is getting longer, and I am pondering about a more serious tournament at longer time controls in Chess for Android. As a first step, I tested all available Android binaries. The list is shown below. An "X" indicates that the engine has trouble running in Chess for Android (if you are the engine author and are interested in fixing this, please contact me for details). Next, I probably do a few quick tournaments to divide the engine in groups by strength, followed by tournaments at longer time control. Please feel free to contact me if you are interested in participating, if you don't know how to compile your engine for Android (ARM), or if you have good ideas about the format of this tournament. I am not really an experienced tournament manager, but merely do this for fun to get an idea of the relative strength of these engines. First inter-protocol tournament on Android! Chess for Android now contains sufficient functionality to perform the first inter-protocol tournament between the built-in Java engine, the UCI engine BikJump, and the WinBoard/XBoard engine Fairy-Max. Ten random opening book games between these engines at one second per move on a Nexus S ran without problems to completion with the following results. 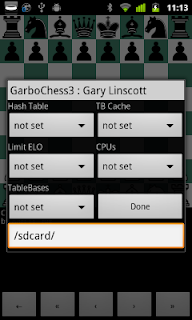 Jim Ablett kindly ported Gary Linscott's engine GarboChess 3 to various platforms, including Android. I also made a dynamically linked binary available at the UCI engines for Android website. As can be seen in the screenshot below, the UCI engines does not provide many options, but it plays strong. Below the results of several quick matches on a Nexus S using random book opening play, one second-per-move, 32MB hash, and 8MB tablebases cache with the 3- and 4-piece Nalimov, Gaviota, Scorpio, Robbobases endgames on SD card. To test recently released versions of Android engines, I conducted a new tournament between the top UCI engines on a Nexus One using a random book opening play, one second-per-move, 32MB hash, and 8MB tablebases cache with the 3- and 4-piece Robbobases endgames on SD card. Congrats again to the Stockfish team! Richard Vida released Critter 1.2 for various platforms, including ARM-based Android devices. Below you can see some screenshots of this UCI engine running in Chess for Android. To get a rough idea of the strength of this new engine, I conducted a few quick matches with other engines on a Nexus One using a random book opening play, one second-per-move, 32MB hash, and 8MB tablebases cache with the 3- and 4-piece Nalimov, Gaviota, Scorpio, Robbobases endgames on SD card. More games upcoming. The new Komodo has been heavily tested by many chess fans, and Larry and Don had to make a few bug fixes. You can find an Android binary of the latest version 2.03 at the usual place. Another tournament between the top engines on a Nexus One, 32MB hash, one-second per move. 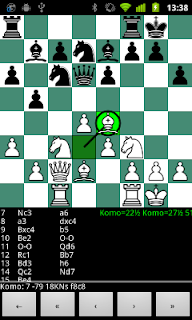 Don Dailey and Larry Kaufman released version 2 of their chess engine Komodo. You can find an ARM-based Android binary on UCI engines for Android. The new release seems stronger than the already impressive previous version. A quick one second-per-move, 32MB hash tournament on a Nexus S against Komodo1.3 resulted in 73 vs. 27 in favor of Komodo2. The new Komodo scored 48.5% against Stockfish 2.1 under the same settings.